We are very much looking forward to welcome you here at BIRCA and share our beautiful spaces and surroundings with you. We will do our very best in order for you to have a wonderful stay – and here are some informations about the place and what facilities we can offer you. The season runs from May 1st to September 30th – it is primarily in this period that we offer residencies, workshops and rehearsal opportunities. We also arrange for open showings of works in progress, performances and other cultural events. Are you interested in a stay outside of season – please contact us via info@birca.org. Booking – all bookings of residencies must be made by email to info@birca.org, and not by phone or other email contact. The booking is final as soon as the forwarded invoice has been paid. Cancellation policy – When cancellation takes place no later than one month prior to the stay, the full payment will be refunded. If you wish to cancel your stay later than one month prior to your stay, we will refund 50 % of the payment. Pets – are allowed here at BIRCA. We have a sweet dog here, Nugga. Smoking – is NOT permitted in all indoor areas. And we appreciate it if you don’t leave any cigaret butts in our beautiful outdoor areas. Travelling to BIRCA – please check out this link for ‘Travel options’. Here you will find information about several means of transport – by plane, train, bus – and phone numbers for local taxi companies. Parking – if you arrive by car, please let us know when you are booking your stay. We have parking space for about 5 cars. Check-in time – is 2pm the earliest or according to some pre-agreement. We are quite flexible, and you are always welcome to enjoy a cup of coffee in our cosy living room or go for a walk while we are getting the room ready for you. Shopping options and busstops – the nearest shopping options and busstops are 1-1,5 km away, in Klemensker. So if you arrive late in the day, it might be a good idea to do your shopping before arriving at BIRCA. The rehearsal studios (white and black studio) – are, respectively, 160 sqare meters and 130 square meters big. They are equipped with a sound system and the white studio has one corner with mirrors. The studios are usually rented out in association with the rooms, according to artist residency arrangements. But should you feel the need to work in one of those studios, please let us know – and we will see, if the spaces are available, at least on selected days. Also, when you are booking your stay, please let us know in advance, if you will need a studio. 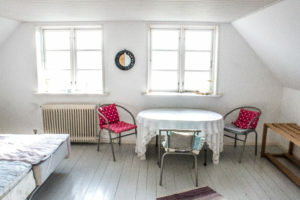 The rooms – are bright, with simple decor and typically furnished with two beds/sleeping options. They are generally spacious enough to put in an extra bed, if needed. The rooms are placed in the main building and in the Atelier, which is situated in the farm building across the yard. Basically, BIRCA has 12 beds in 6 rooms, but the first floor in the Atelier can easily be turned into a dormitory for approximately 10 people. Bed sheets and 1 towel per person – is included in your stay. An extra bed, sheets and towel can be purchased on site and paid for at your departure. If you have any questions in this matter, please contact us at info@birca.org. The washing machine – in the basement of the main building can be used as needed. If you have a longer stay at BIRCA it is up to you if you want to wash your bed sheets and towel, and even clothes, during your stay. Common kitchen facilities – are situated in the basement of the main building. There is a gas cooker, a refrigerator, a freezer and a dishwashing machine. The Atelier har a little refrigerator and a water boiler for coffee/tea. Food and cooking arrangements – basically, all residents are responsible for their own meals, since there is no kitchen staff employed. Being a working residency site we also cherish each person’s right to customize their meal times according to their own individual working process. However, we can arrange for common shopping and meal preparations, where all implicated help out. Just let us know when you are booking, if a common meal arrangement is of interest to you. Common toilet and bathing facilities – are situated on the ground floor in the main building. 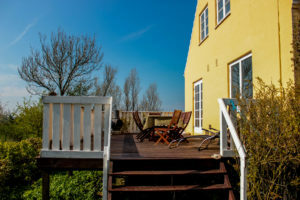 We also have a wondeful Lo with a View and outdoor bath behind the atelier. Common areas – in the main building we have a cozy living room with a fire stove and a dining/conference room with space for 8-10 dining persons. Just outside there is big beautiful terrace with space for 8-10 dining people. Further, we have a lot of small enticing sun and shadow spots on the site, partly furnished with tables, benches and sunbeds. A bit further down the road there is also a little stretch of forest to explore. A color printer – is placed in the office of the main building and the cost is DKK 1,- / Euro 0,13 per A4 page. Bicycles – we have 3 bikes at BIRCA and they can be used as needed. However, should you lose or break one of them we will ask a replacement payment of DKK 1000,- / Euro 130,- . Voluntary practical work – BIRCA covers quite a few buildings and outside areas, including a small vegetable garden. Should you feel the need for a break and would like to put your hands in the soil, then you are more than welcome to help out in the garden or with any other practical/physical work. It is completely voluntary and is in no way expected of you! Nearby beaches and beautiful nature sites – the nearest beach is on the West coast, in Hasle, about 8 km from BIRCA. If you want to visit one the island’s most magnificent nature sites, we recommend a 2-3 hour walk around the Northern tip of the island, called “Hammeren” (the hammer – due to it’s geographic shape). It is about 14 km from BIRCA, near the northeastern coastal town of Allinge-Sandvig. There are regular busses from Klemensker to Allinge-Sandvig. For information about the regional busses on the island – click here. The closest busstops are in Klemensker, approximately 1,5 km from BIRCA, or in Hasle. 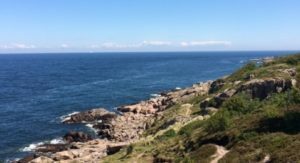 You can find more information about Bornholm’s cultural attractions and beautiful nature sites under ‘About Bornholm’. Wireless internet / wifi – is available. The code will be handed out to you at arrival. Final cleaning of your room – if you do not wish to clean the room yourself, we will charge an additional cost of DKK 200,- / EURO 26,- to clean the room for you. Check-out time – is 12 noon the latest or according to some pre-agreement. We prefer to receive your bed sheets and towel as early as possible on your day of departure so we can prepare for the next residents.